This newsletter features photos or paintings of a number of famous Shakespearean actors of the last few hundred years playing Macbeth and Lady Macbeth. How many of them can you identify? Answers will be posted on the Macbeth page of our website in April! The ISC's auditions for Macbeth drew the largest group of auditionees we've ever had. We even had a news crew from IC-TV there one day to cover them! We were very excited by the amount of talent, preparation, enthusiasm, and professionalism on display. Many thanks to all who came! A little bit of historical trivia: the real Macbeth was nicknamed "The Red King," apparently because of his red hair and ruddy complexion. How often do you see that in a stage Macbeth? Both Macbeth and Lady Macbeth were actual figures in Scottish history. Macbeth ruled from 1040-1057 and seems to have been regarded as a relatively good king. He did kill the previous king, Duncan, in battle in order to take the throne — but that was standard practice for pretty much every Scottish king of the time, including Duncan. And Macbeth is often credited with bringing a measure of stability and prosperity to Scotland. As proof of this, he was able to go on a pilgrimage to Rome in 1050, where he "scattered money like seed to the poor." 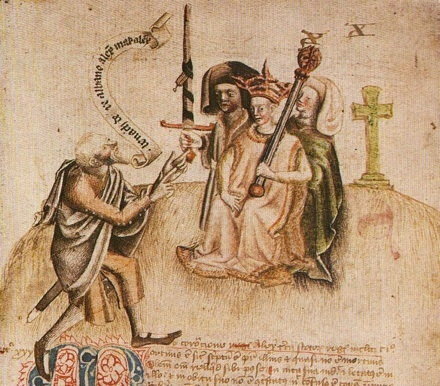 Note the royal poet on the left, reciting a proclamation to the king and wearing an early form of a kilt! 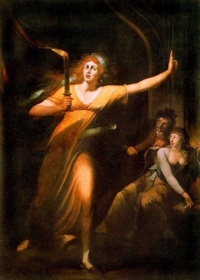 Lady Macbeth, whose name was Gruoch, was an important woman in Scottish history. 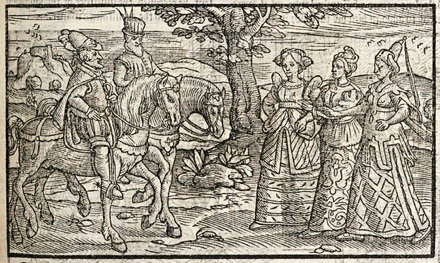 Her first husband was killed by Macbeth, who then married her and became stepfather to her son from that first marriage. Both Macbeth and Gruoch were descended separately from different Scottish kings, so their marriage brought together multiple claims to the Scottish throne, making Macbeth a more legitimate king than Duncan had been. Shakespeare probably knew very little in the way of actual facts about the life of the historical Macbeth. He borrowed the story of Macbeth from one of his favorite sources, Holinshed's Chronicles, the first history of the British Isles published in English. Holinshed's narrative is far from being an accurate history as we would think of it today. It's more along the lines of what we might call historical fiction: entertaining stories that draw on history for their material but embellish and fill in gaps as needed. The plot of Macbeth combines elements from two different stories found in Holinshed. In the first, a man named Donwald finds several of his family put to death by his king, King Duff, for dealing with witches. After being pressured by his wife, he and four of his servants kill the King while he is a guest in Donwald's castle. 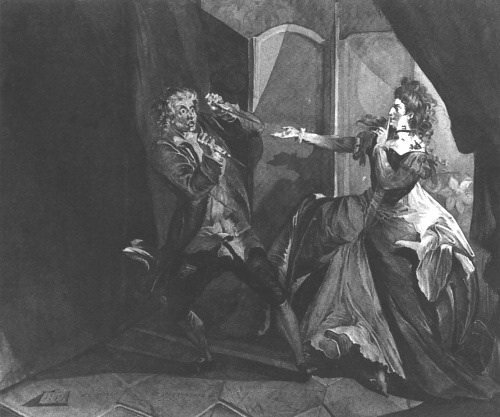 The circumstances of the murder have many similarities to those in Shakespeare's play. 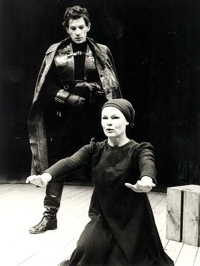 Macbeth and Banquo then plot the murder of Duncan together, at Lady Macbeth's urging. Duncan is killed in an ambush, however, not in Macbeth's own castle. Macbeth has a long reign before eventually being overthrown by Macduff and Malcolm. 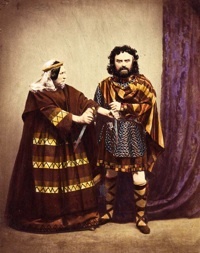 By combining the story of Macbeth with the type of murder committed by Donwald, Shakespeare adds to the darkness of Macbeth's crime as the worst violation of hospitality. But he also creates greater opportunity for exploring the psychology of his main characters. 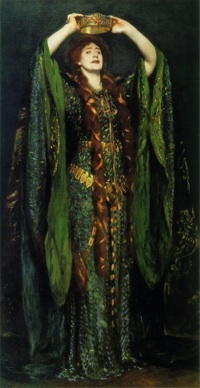 Lady Macbeth is one of the most coveted female dramatic roles in all of theatre. So how does an actor approach a part like this? 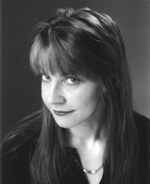 In our production, the role will be played by ISC veteran Melanie Uhlir, who answered a few questions about the process and the role. How do you prepare for a part like Lady Macbeth? Practice, practice, practice. And I study the notes in one of those heavily annotated editions to make sure I understand exactly what I and the other characters are talking about. After all this time, I have a pretty good handle on Elizabethan lingo, but it's always worthwhile to study the notes no matter how long a person has been working with Shakespeare. After that, I just try to get inside the character's head and figure out what might motivate him or her (I get cross-cast sometimes). I think I sometimes inadvertently take on some of the personality traits of the character I'm working on. I don't plan on inciting anyone to murder though! What do you want the audience to understand about Lady Macbeth? I would love it if at least some people in the audience would come away thinking the play is tragic for her character too. That she's not simply evil or a one-dimensional monster. I want to make sure she comes across as human. It's somewhat daunting but also an exciting challenge. I feel fortunate to get to play her. You were last seen as Puck in the ISC's production of A Midsummer Night's Dream. Which is harder, playing a comic character like Puck or a dramatic one like Lady Macbeth? Comic roles come more easily to me psychologically, though I work every bit as hard on them. I really love comedy and I don't like to take myself very seriously, so I usually feel more at ease with a comic role. Plus, Puck is a hobgoblin and Lady M is a woman. And I find it much easier to play a hobgoblin than to play a woman. Next time: a conversation with our Macbeth!